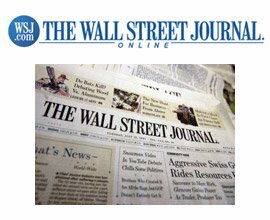 The Ocean Rider Kona Seahorse Farms and educational tours have drawn the attention of the Wall Street Journal. We have included the video and the article reprint featured in the August 17th USA edition. Lisa Parnpichate says she is obsessed with collecting seahorses as pets, but her past efforts to keep the delicate creatures alive repeatedly failed. This year, she gave it one more try. The Houston resident says she devoted hours going through tutorials on how to care for seahorses. She built a specially designed aquarium that keeps a constant temperature and provides plenty of places for the animals to hang onto with their tails. Then she located a new supplier, a breeding facility in Hawaii that had figured out how to raise the animals in captivity. Her total investment: about $6,000, she estimates. Video Credits: Carol Harding Productions – “PORTRAIT OF A PIONEER”. A series featuring unique and inspirational individuals changing our world today. Five months later, Ms. Parnpichate’s seahorses-four males and three females, which she named after Norse gods-are doing fine. The 38-year-old says she talks to them and reaches into the water to hold them. Ms. Parnpichate, who works as a special agent in federal law enforcement, says her friends are “amazed” by the pets. The animals are so unusual and most people haven’t seen them up close, she says. The biggest attraction: Thor, who is six-inches long and very active in the tank. A long snout seahorse, one of 48 known species, in an aquarium. What made the difference for Ms. Parnpichate was the growing popularity of captive-bred seahorses. New techniques and recent discoveries about the animal’s behavior have enabled breeders to set up aqua-farms for raising seahorses in places like Mexico, Australia and Hawaii. In the past, most seahorses found in home aquariums, including Ms. Parnpichate’s, were plucked from natural habitats like coral reefs, seagrass beds and mangroves, contributing to their declining populations, experts say. Captive-bred seahorses, which retail for as much as $85 each, are less disease-prone than their wild cousins, breeders say. They also can live for more than a decade, far longer than the few months seahorses captured in the wild do. “It’s more expensive but well worth it,” Ms. Parnpichate says. The global population of seahorses has plummeted by as much as 80% in some locations since 2005, according to the U.N. Convention on the International Trade in Endangered Species (Cites). Hobbyists contribute to the decline. In June, New York State lawmakers banned the commercial netting of seahorses for sale in tropical-fish stores. More problematic for seahorse populations are habitat destruction and demand for the creatures for use in traditional Chinese medicine. Cites estimates at least 10 million seahorses are taken from the wild in an average year for medicinal purposes, ranging from kidney disorders to impotence. “The status of seahorses is perilous,” and most species are listed as threatened or endangered by international conservation groups, says Amanda Vincent, research chairwoman in marine conservation at the University of British Columbia’s Fisheries Centre and director of Project Seahorse. “There is an inherent wonder about them that is worth preserving,” she says. Aqua-farming is used with other fish, of course, especially food stock like salmon and cod. Breeders don’t expect aqua-farming can replenish the world’s seahorse populations, but it can significantly reduce the number captured for hobbyists. Christopher Buerner, president of aquarium-fish wholesaler Quality Marine, in Los Angeles, says he now purchases seahorses solely from breeders. He says captive breeding has helped increase the interest in seahorses among hobbyists. Although seahorses don’t look like typical fish, they are in the same class as salmon and tuna. When reproducing, it’s the male seahorse that becomes pregnant and delivers the young. Most species appear to be monogamous, remaining faithful to one partner for the breeding season and perhaps several seasons. Breeding seahorses in captivity became possible only in recent years. The biggest hurdle was training them to eat frozen shrimp instead of their natural diet of small live crustaceans and other invertebrates, says Carol Cozzi-Schmarr, president of Ocean Rider, a seahorse aqua-farm in Kailua-Kona, Hawaii. The animals, which have no stomach or teeth, were reluctant to try the frozen shrimp, partly because they don’t move through the water the way their natural food does, she says. Finally, one seahorse, which the breeders nicknamed Mikey, accepted the change of diet. The Ocean Rider breeders moved Mikey from one tank to another to teach the other seahorses by example to eat the frozen shrimp. 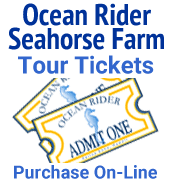 When you tour Kona, Hawaii you can learn all about us on our Kona Seahorse Farm Tour now running at noon and 2 pm Monday through Friday. During the Holidays we will be offering 3 tours per day for the Monday through Friday at 10am, noon, and 2 pm. Please call ahead for reservations! Aloha!